Sinoia and Justin did major work in the Garden yesterday: massive amounts of new spring weeds that appeared overnight were forcibly removed (actually they got a start long ago, we have not been on top of them.) And then the raised beds were enhanced with bushels of compost and then there was planting: peppers both sweet and hot; tomatoes both large and small and even seeds. Direct sowing tomato outside in NYC is a risky thing. Will they produce fruit in Sept./October as hoped? This is a minor experiment. In the perennial bed: rosemary, lavender, parsley, tarragon. Way off at one end a new mass of flower seeds got their start (we hope): poppies, zinnias, cosmos and something else that this fella can’t remember. At the last minute, we did up a few mounds of 2 yr olde cantaloupe seed. Another minor experiment. It was really a beautiful day up on the roof. Exceptionally bright and breezy. We also watered and fertilized the bok choy that is growing well in the raised beds outside. The whole farm up there is looking good, as are the farmers. 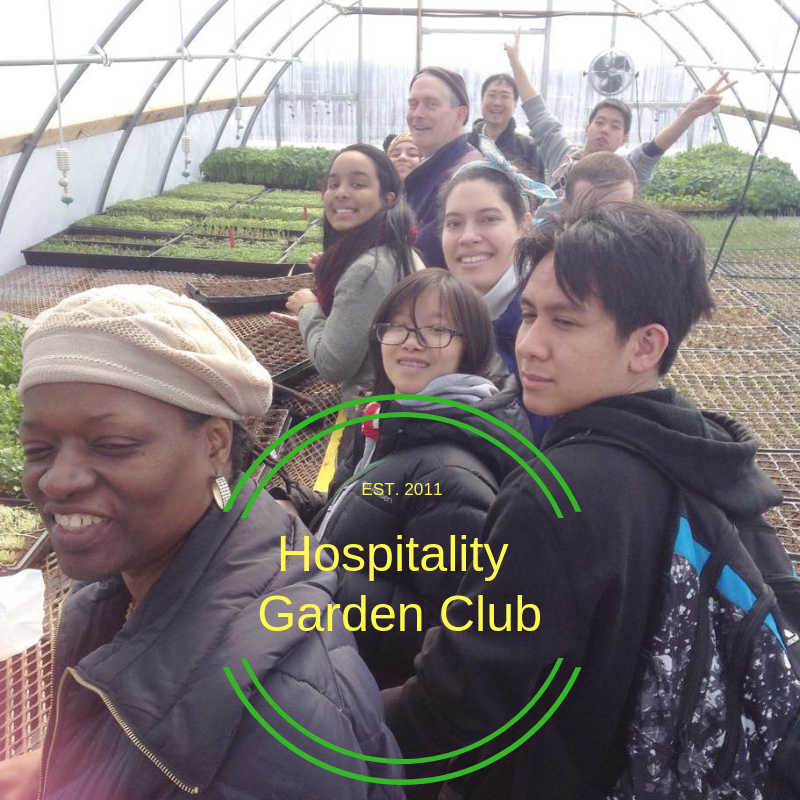 Keep growing, keep giving back, Maen and Dana. It was warm in the greenhouse on Friday. And just enough room for 5 people. VP Dean, secretary Nick, grunt Henry, and all around hard working Justin planted nearly 300 pepper and tomato seeds. Tomato varieties included Indigo Rose, Black Krim, Rutgers, and Roma, Don’t you love the names? Like craft beers. Peppers were Jalapeno, Black Hungarian, Marconi red and golden, and Cubanelle. Thankfully these guys all have good eyes b/c otherwise it is hard to see those little seeds. And with a little luck, they will all sprout & grow into strong plants for us to sell at the spring Plant Sale. Members of the Garden Club will be serving (and demonstrating) a number of desserts that feature fresh basil from the Garden. 12:45 in Namm 206 Come early for the best choice. Thankfully, it does cool off on the roof in the evening. And early mornings are nice up there too. A good breeze helps, but that same ‘sirocco’ wind has blown the tomato and peeper plants off kilter. Handily, Dah -wei has re-staked them and there has not been significant damage. The kabocha squash has not fared so well– squash bugs have destroyed much of the plants. (Why do we keep attempting winter squash? Because we had success one year and we always get SOME good ones even if the plant looks like something the cat dragged in.) Luckily the zucchini is thriving. As are the haricot vert plants. We are waiting to see what the beans are like and if they have a French accent like Caroline and Malika do after their Paris trip. Just last week they planted cilantro and more zukes and did stupendous weeding. 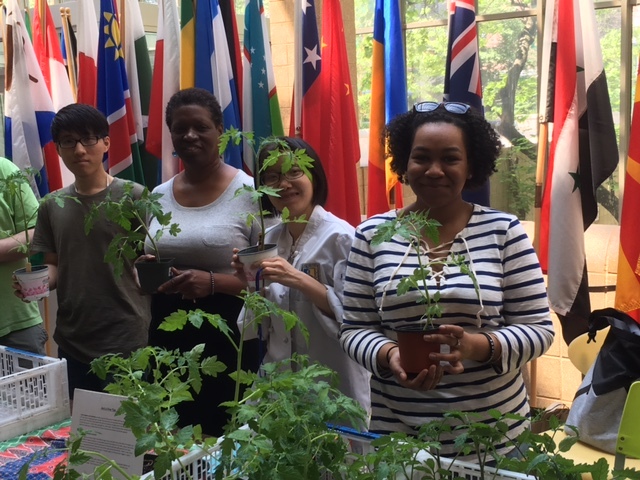 Caroline Malika and Dah wei will be at the garden again next Thursday or Friday to harvest more cape gooseberries and tomatoes, transplant basil (remember the tiny purple basil that easily gets stepped on)…and do general maintenance. And pick flowers, (but let peppers get color).